This is a paid partnership with Hobbycraft, all opinions are my own. And then she was 4. 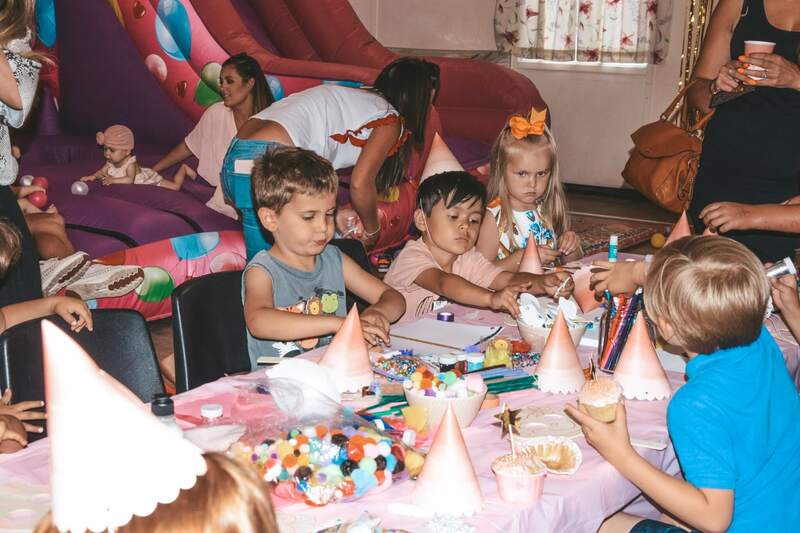 As Ivy is starting school in September we thought we would have one big party for all of her friends and our friends. 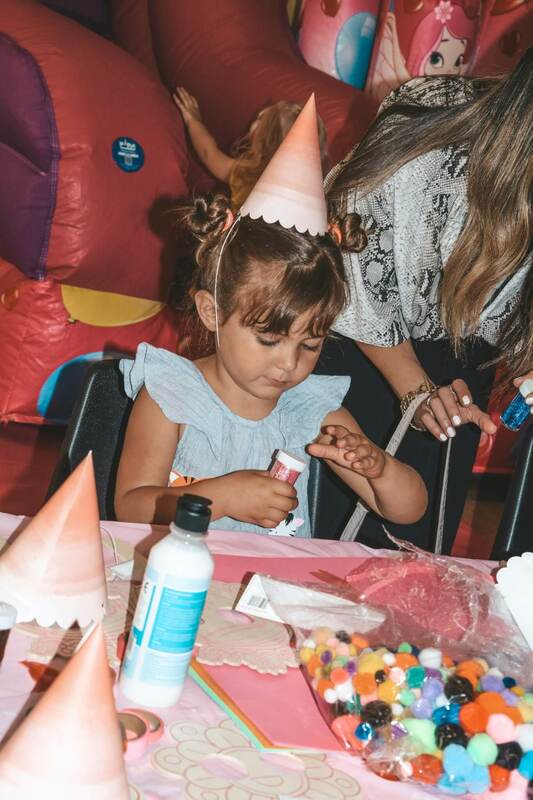 We are so excited to have worked with HobbyCraft for her Party. After browsing all the themes they had to other we decided to go for a Pink and Gold theme, as pink is her favorite colour. So after writing my list of everything I needed to order, I was surprised how much of it I was able to get on the HobbyCraft Website. Ill be writing my lists with the links to all of the items hopefully this will help with your party planning. All you’ll need to do is click the word/link of the item and it will take you directly to it on their website. First up on my list was decorations! Thats what makes the theme isn’t it?! Balloons – thats a given. You can also get the helium canisters. We got 2 and that was enough for 7 Pink balloons, 3 large confetti balloons and 2 large gold foil number 4s. And the balloon weights. Table Covers – Disposable table covers are always the best because you can just roll up all the rubbish and left over food and just get them in the bin. We went for pink but there are loads of colors to choose from. 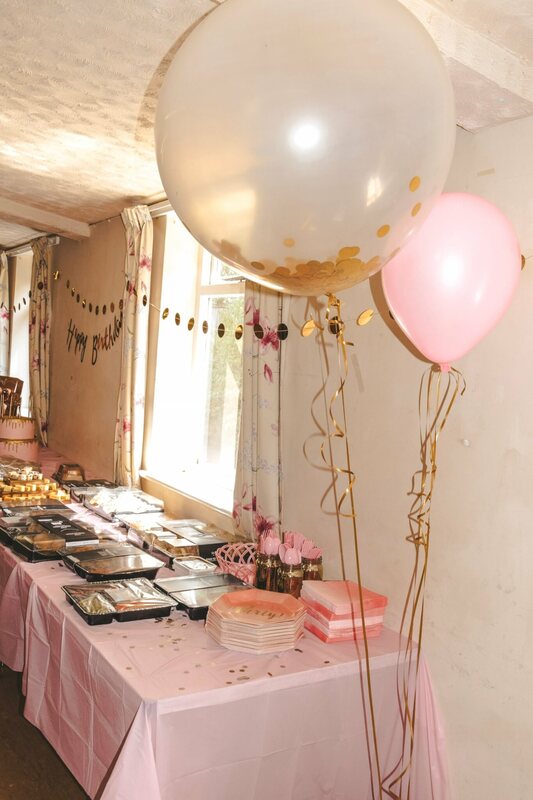 Bunting and decorations – Our hall that we booked was little bit dull so I wanted to make it look as pretty possible. Hobby craft stock one of my fave decoration brands Ginger Ray. 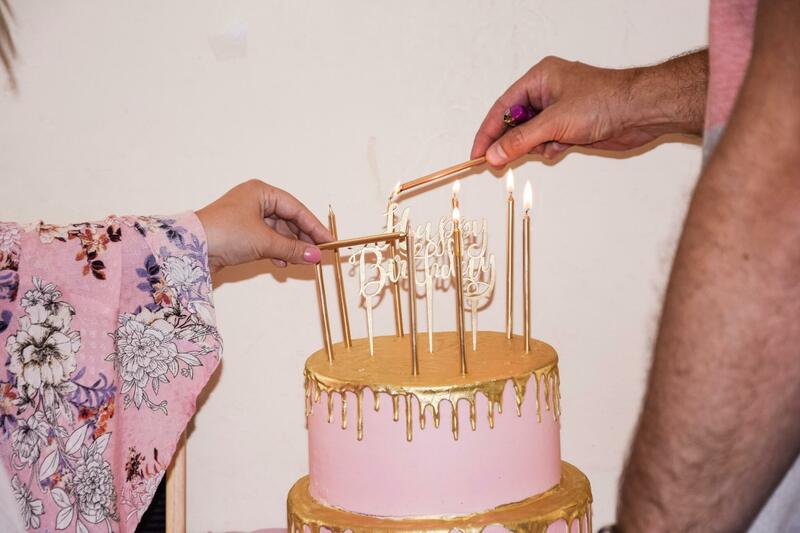 We had Gold foil Happy Birthday bunting, Gold Circle bunting, Pink Tassel garland, and of course a gold foil backdrop for pictures. I sprinkled the tables with gold confetti. 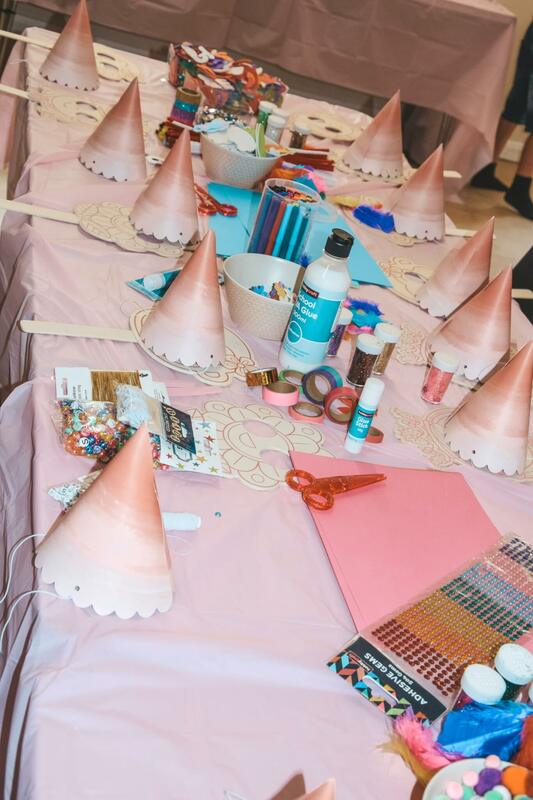 Party hats, in prettiest pink ombre. 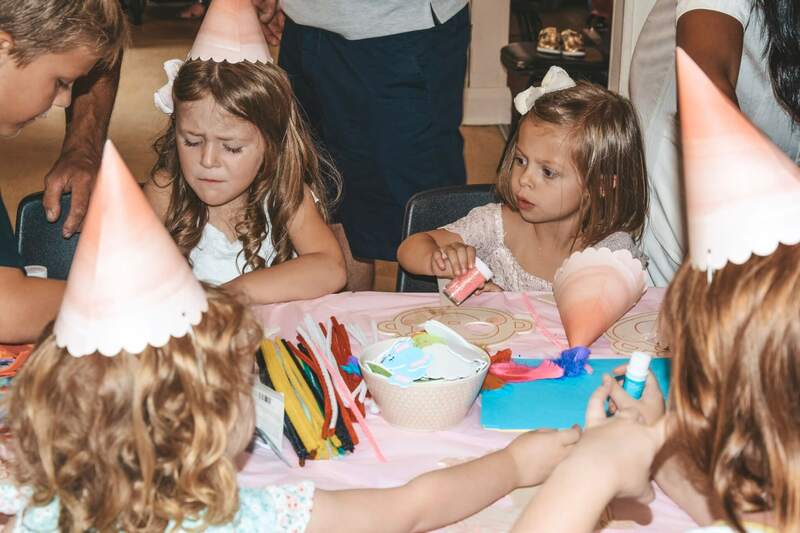 I also found those cute letter boards on the website we had one by her a cake and then one on the table out in the garden with ” IVY COCO TURNS 4″ on them. 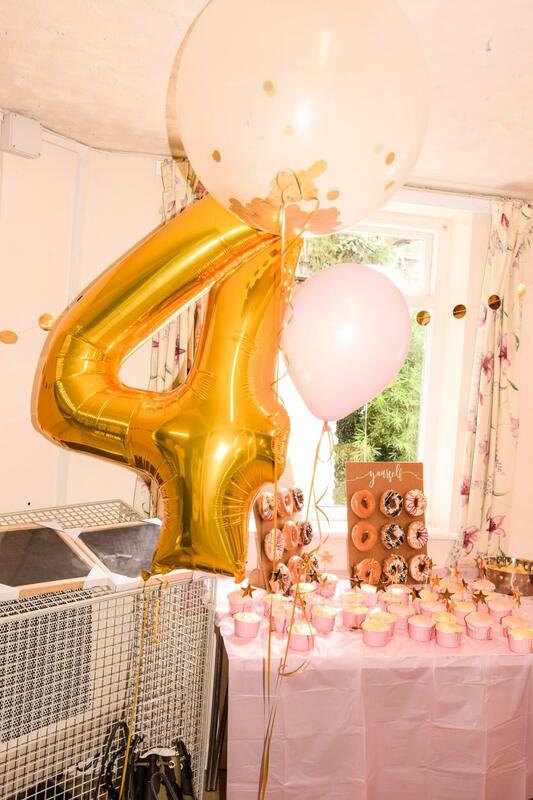 Doughnut walls are currently a big party trend on Instagram, I loved the Ginger Ray one we got from the website literally took 2 minutes to put up and all the doughnuts got devoured! Party plates, cups and bowls – you can get them all in the same theme, which makes it so much easier looks nicer. 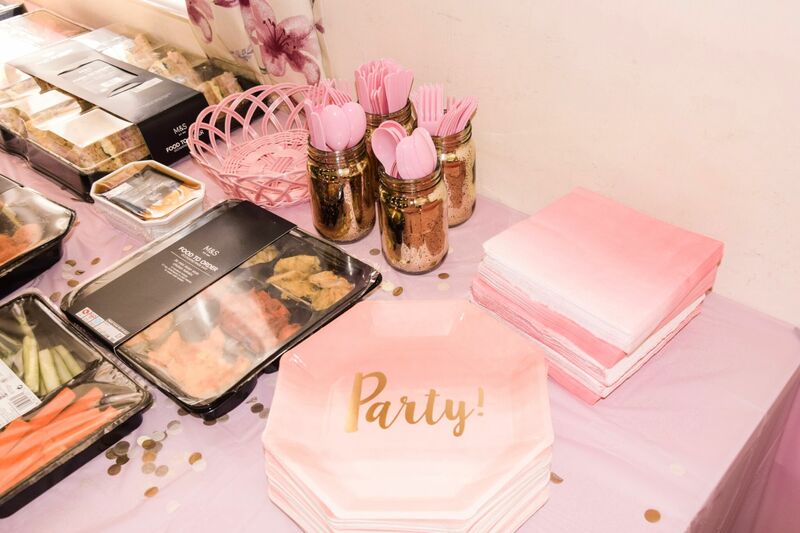 We had Pink Party Ombre plates, Cups (we run out so make you sure you get more than enough) Napkins, and packs of pink knives, forks and spoons. We had all the cutlery and straws on the table in these lovely gold jars. For Ivy cake we had a simple wooden Happy Birthday cake topper that I spray painted Gold, and tall gold candles. Sweety jars and Sweet Bags because if the kids can’t fill up on sugar at a party when can they? You may have also seen on our Instagram a little video of myself and Ivy making cakes. You can also get the pink cupcake cases, pink food dye, stackable cooling rack, edible gold glitter, dusting brushes, pink sugar pearls, and gold star cupcake picks all from Hobby craft! Next up party bags! I found some lovely white with gold polka dot party boxes which i thought would be more practical as the birthday cake slices won’t end up a mess by the time its eaten. I filled them with Bubbles (which we also had a few bottles for outside in the garden), Glowsticks great for bath times, water pistols, and metallic washi tape. 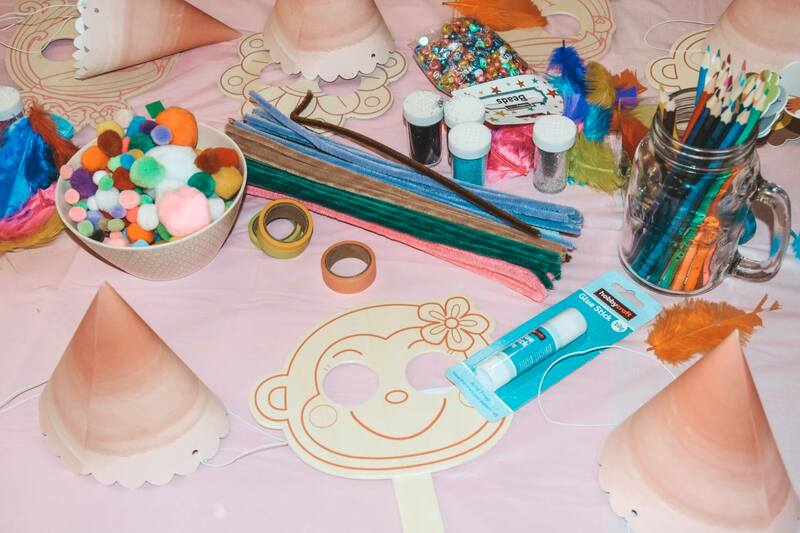 Wooden Mask decorating ( Princesses, Flowers, and Monkeys) massive hit!! Paper & Card for sticking – Bright coloured card, plain white paper, metallic scrap paper. To Decorate – pipe cleaners, glitter shakers, mixed colors and sizes of pom poms, feathers, little eyes, big eyes, gems, pastel colored stones, pink flower gems, pencils, felt tips, metallic washi tape, neon washi tape, glitter washi tape, flowers & lady bird stickers, and assorted foam animal stickers.To stick – PVA glue and spreaders, glue sticks. We also had bracelet making for the kids all you need is some white elastic and alphabet beads. 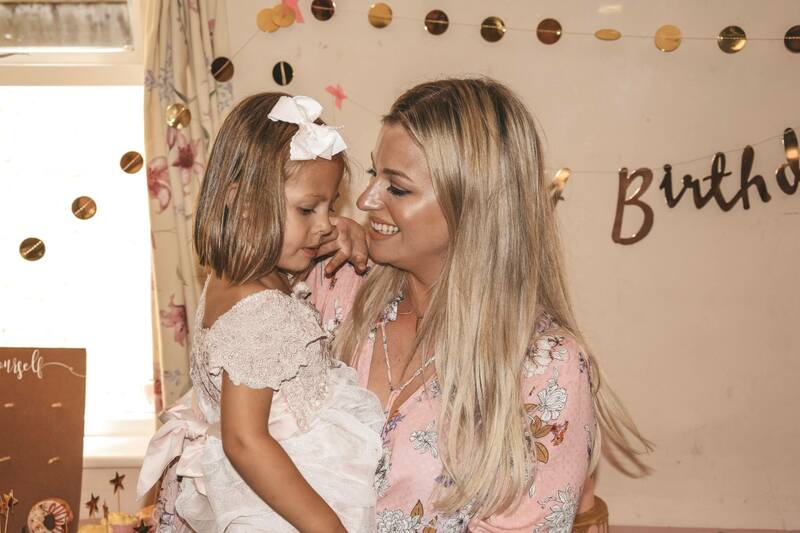 I hope you’ve loved seeing how we celebrated Ivy’s 4th Birthday. Even though I said no more big parties for a while looking at all these pictures of how much fun it was is making me wanting to plan for next year haha.